Owners of the Alliance pipeline, one of the longest natural gas pipelines in North America, are in the early stages of assessing interest in expanding its capacity to transport natural gas from western Canada to Chicago (Illinois, USA). "Alliance pipeline in early stages of assessing capacity expansion"
The Alliance pipeline is unique because, unlike other natural gas pipelines that only transport natural gas after it has been processed, Alliance carries unprocessed natural gas. Unprocessed, or wet, natural gas contains ethane, propane, butanes and natural gasoline, as well as methane, the primary component of natural gas. 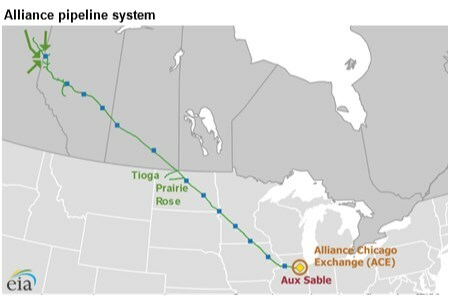 The Alliance pipeline currently has the capacity to carry up to 1.6 billion ft3/d of wet natural gas from production sites in Alberta and British Columbia in western Canada along 2391 miles of pipeline to the Aux Sable natural gas plant liquids (NGPL) extraction and fractionation facility near Chicago. The expansion would add up to 0.5 billion ft3/d of capacity, for a total throughput of more than 2 billion ft3/d, potentially starting November 2020. Most long-haul natural gas pipelines transport natural gas after processing, meaning that the natural gas in the pipeline has had NGPL removed and consists of mostly methane. Generally, wet gas is moved on gathering lines under low pressure that allows NGPL to remain mixed in the gas stream. Alliance is the only pipeline of its kind that transports wet natural gas prior to processing over long distances at high pressure. It accomplishes this feat by modulating pipeline pressure up to nearly 2000 lbs/in.2 to ensure that the mix of methane and NGPL does not separate while in the pipeline. Because demand for NGPL is limited in western Canada, the original designers of the Alliance pipeline determined that it would be economically favorable for Canadian producers to transport the growing volumes of natural gas produced in western Canada to Illinois for processing and marketing rather than to build processing facilities in western Canada and ship the liquids and dry natural gas separately. Since 2010, the pipeline has added capacity in North Dakota (USA) to enable natural gas produced in that region to be transported to Aux Sable. The Prairie Rose lateral pipeline transports up to 0.12 billion ft3/d of wet natural gas from the Palermo conditioning plant, and the Tioga lateral receives up to 0.13 billion ft3/d of wet natural gas from the Hess Tioga natural gas processing plant. After processing at Aux Sable, natural gas is delivered to several major interstate natural gas pipelines in the Alliance Chicago Exchange, a market hub that offers title transfer, wheeling, and park and loan services. Pipelines receiving the processed natural gas – including the ANR Pipeline Company, Natural Gas Pipeline Company of America, Midwestern Gas Transmission Company, and Vector Pipeline Company – then send it to customers in Illinois, Indiana, Ohio and Michigan (USA), as well as Ontario (Canada). NGPL recovered at Aux Sable are delivered to market by rail, pipeline, and direct connections to local refineries and petrochemical facilities. The potential pipeline expansion involves a call for interest among market participants. If the level of interest is sufficient, Alliance may hold an open season for bids in autumn 2017, when natural gas producers or other shippers form agreements with the pipeline company to demonstrate to regulators that, if built, the additional capacity would be used.